Taille de cet aperçu PNG de ce fichier SVG : 800 × 566 pixels. Autres résolutions : 320 × 226 pixels | 640 × 453 pixels | 1 024 × 724 pixels | 1 280 × 905 pixels | 1 052 × 744 pixels. English: Principle of a public key infrastructure. 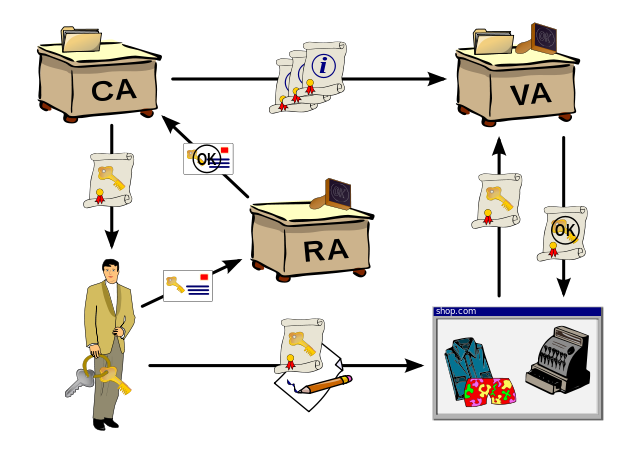 Rough outline: A user applies for a certificate with his public key at a registration authority (RA). The latter confirms the user's identity to the certification authority (CA) which in turn issues the certificate. The user can then digitally sign a contract using his new certificate. His identity is then checked by the contracting party with a validation authority (VA) which again receives information about issued certificates by the certification authority. CA: Autorité de Certification ; VA: Autorité de Validation ; RA: Autorité d'enregistrement. See other versions of these images for translateable versions. Ce document provient de « https://fr.wikipedia.org/wiki/Fichier:Public-Key-Infrastructure.svg ».